It’s her final year of high school and Ebony ‘Black’ Marshall is counting down the months, weeks and days until she can leave town. A string of unfortunate coincidences has resulted in suspicious locals deciding Black is cursed, and she can’t wait to put the small town gossips and their small town superstitions behind her. Black is a loner at school and that’s just the way she likes it, until new guy Aiden surprises her by inviting her to the formal. When Aiden ends up in intensive care, some people take it as confirmation that Black is cursed and she goes from being an outcast to the target of a small group of religious fanatics who are determined to ‘save’ her from the cause of her misfortune. As events spiral out of control, who can Black trust and can she work out what is going on before she becomes the next victim of the curse? This intense thriller by Fleur Ferris, author of the bestselling Risk, had me on the edge of my seat. By the end of the first chapter I was already connecting with Black, and enjoying her banter with Aiden and the courage with which she dealt with the challenges she faced. The following chapters added to her appeal, revealing a strong, determined, engaging character. As the threatening behaviour of some locals escalated, I felt increasingly anxious on her behalf and as the story approached its climax, I felt like a helpless bystander to her fear. With so much focus on Islamic religious extremism in our mainstream media, it was interesting to read a novel that highlighted the potential consequences of Christian fanaticism. I don’t want to risk any spoilers, so I won’t go into details of the nature of the threats Black faces. Suffice to say that as the story progressed, I went from reading it just before going to sleep to sitting in my well lit lounge room in the middle of the afternoon. With the lights on. And my phone beside me. Just in case. 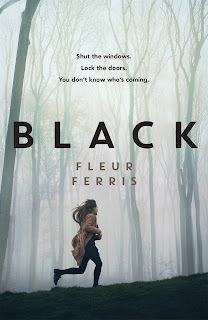 Fleur Ferris has delivered another gripping, suspense-filled real-life drama that will appeal to teen and adult readers. If you haven’t read her previous novel, Risk, make sure you grab a copy of that too. While Risk deals with the potential danger of strangers online, Black highlights the potential menace and hidden agendas of people we know. Both books are highly recommended.